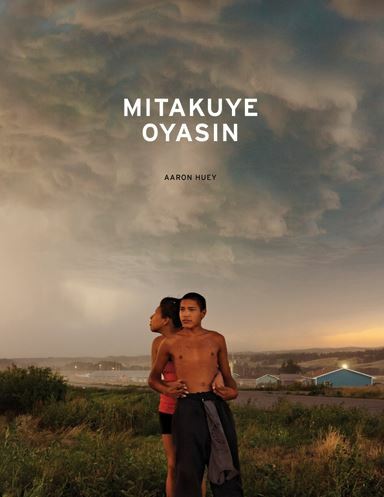 Book Review Mitakuye Oyasin By Aaron Huey Reviewed by David Ondrik Aaron Huey's Mitakuye Oyasin is a challenging book of photographs, heavy with the weight of history, of the Pine Ridge Indian Reservation in South Dakota, USA. The English translation of the title is All My Relations, but, as you might expect, something is lost in that translation, which doesn't cover the depth of the phrase's meaning. Relations is not just your blood. It's community, land, sky, plants, insects, friends, enemies. Everything is connected. And you have a responsibility for your Relations. Mitakuye Oyasin. Photographs by Aaron Huey. Radius Books, 2013. Hardbound. 208 pp., 134 color illustrations, 9x12-1/2". Aaron Huey's Mitakuye Oyasin is a challenging book of photographs, heavy with the weight of history, of the Pine Ridge Indian Reservation in South Dakota, USA. The English translation of the title is All My Relations, but, as you might expect, something is lost in that translation, which doesn't cover the depth of the phrase's meaning. Relations is not just your blood. It's community, land, sky, plants, insects, friends, enemies. Everything is connected. And you have a responsibility for your Relations. Understanding the full meaning of the title is imperative to understanding where Huey is coming from. He's dealing with an extremely difficult subject. The history of white people photographing brown people is usually the history of power politics, ethnic and cultural bias, and preconceived notions. Despite his good intentions, Edward Curtis's iconic 19th century photographs of Native Americans are now widely understood to reflect the photographer's ideas of what his subjects were, rather than their reality. The popular example of this is the removal, via retouching, of a clock from In a Piegan Lodge. In Curtis's mind, Little Plume and Yellow Kidney told time by the position of the sun, or maybe a deep spiritual understanding of the world, but certainly not with a clock. Couple this with the fact that Huey is an outsider, by nature of being a photographer for National Geographic and Harper's. He comes from privilege so far removed from life on the Pine Ridge Reservation that he may as well be from outer space. Perhaps more dangerous than an alien invasion, Huey could also be yet another Concerned White Person (school teacher, priest, energy company executive) with pity in his heart and good intentions in his head, out to save the Indians from themselves. Mitakuye Oyasin, by Aaron Huey. Published by Radius Books, 2013. As well as transubstantiating his book into a spiritual ceremony, titling his book Mitakuye Oyasin is Huey's way of acknowledging his difficulties in representing, in speaking for, the Oglala. To paraphrase Andrew Ironshell's introduction, Huey is firmly aware of his responsibility to the humans around him, the land, the environment, enemies, family, and history. He knows he's an outsider, but over the course of seven years he has formed powerful Relations with the Oglala and he has been welcomed in a way that, I imagine, few outsiders are. And the fact remains that, because of his position, Huey's voice will be louder than anyone on Pine Ridge. With support and encouragement from his Relations, he may be able to be a voice for the voiceless and call much needed attention to our broken Reservation system. The photographs in Mitakuye Oyasin show that Huey was eventually welcomed into the intimate spaces of Pine Ridge. The 134 images include interiors, portraits, and landscapes; all are made with the degree of exceptional skill you'd expect from someone with Huey's background. Some photographs seem candid, while the subjects are active participants in others; all are startling and moving. We are treated to images of tattooed 21st century gangsters (warriors? ), a still-life with a portrait of Red Cloud, the gin blossoms of alcoholics, young men on horses, a tremendous pile of discarded clothing, a double rainbow over sweat lodges. Although there are some uplifting moments, Huey's portrayal of the Reservation is a place of staggering poverty and hopelessness with very few moments of light or uplift. In a place with 90% unemployment, a male life expectancy of 47 years, and a median household income of $21,089, it's difficult for this outsider to criticize his viewpoint. But I can't help but wonder if the residents of Pine Ridge view this as a fair portrait of their home. The editorial choice was made to leave out captions, titles, or any information about the people in the photographs. I recognize the preparation for a Sundance, but if you are not familiar with that particular ceremony, there's nothing to tell you that is what you're seeing. Left on its own, the meaning of a photograph is malleable and often reflects what the viewer already believes. Is this level of poverty in the United States a national embarrassment or an example of an inferior culture? People with either viewpoint can look at the photograph of the child standing on a red Power Wheels car and see confirmation of their pre-existing belief. This is more a shortcoming of the medium than anything Huey has interjected himself, but by leaving out written contextual information he misses the opportunity to inform the uninformed. Is the child bathing in the kitchen sink completely fine to be doing so or is this a portrait of neglect? The photograph contains evidence for both readings. The lack of written information is frustrating in another way. Those of us that come away from Mitakuye Oyasin with the "lump in your throat and the tear in your eye" that Buffy Sainte-Marie sang about will find no guidance here in turning thought into action. It's not even clear if buying this book in any way supports Pine Ridge. I personally believe that Huey is not enriching himself with photographs of poverty, but it would be reassuring to have some confirmation.